Christmas shouldn't be a game of who wins. Really. It shouldn't. It's about giving happiness and graciously receiving yet another something you don't like. It's about feeling something other than the gimmies, which we were counseled against while children, but then asked, by everyone, "So what do you want for Christmas?" We start the consumerism early, folks. Yet, there are times when something is given which is perfect. Last year, my oldest niece, Christina, gifted me with an Iowa Hawkeyes mobile. Perfect. Totally perfect. It could be said that she 'won' Christmas with the ultimate gift. This year, it was my turn. One of the souvenirs people tend to come home with from Disneyland is a mouse-ears hat. The first time Carole and I went to Disney World, we got mouse hats, with our names on the back of them. You can order personalized hats from Disney's online store, but it's so much more satisfying to buy them and watch as the computerized sewing machine adds a name to the back. My mother is never going to Disneyland or Disney World. Both involve travel which would be tiring for her. Plus, there is the walking. Of all the amusement parks on the planet, Disney parks are geared to be enjoyed by ambulatory as well as people on crutches and scooters and in wheel chairs. It seems to me Disney architects recognized, long before they were required to, people with disabilities shouldn't be left out of the Disney experience and there are wide avenues for travel. But that still doesn't mean mom, even with a scooter, for instance, is going to travel to either park. Enter Christmas and my trip to Anaheim. I knew, heading out there, that she needed a mouse ears hat. Maybe needed is too strong of a word. She deserved a mouse ears hat. 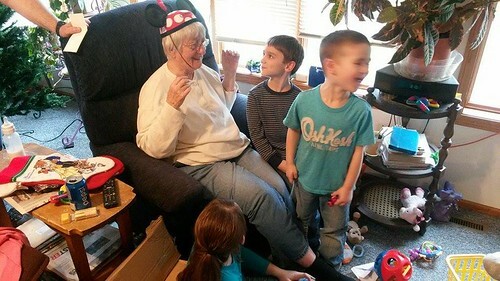 At her 80th birthday, great-granddaughter, Makayla, got her to wear a tiara and carry a wand. Mouse ears were the next step up in head gear. 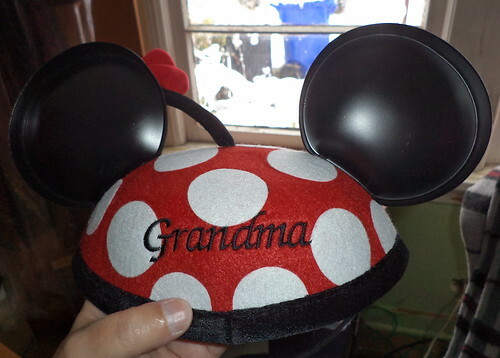 I also knew the hat had to be personalized with "Grandma". On Sunday, November 8th, when Ashley, Liz and I walked into Disneyland, my first stop was the hat shop. They have everything you could want in Disney-fied head gear, everything; from Elsa's frozen tiara, with mouse ears, of course; to a cowboy or Christmas stocking hat with mouse ears. All of the hats could be personalized. After a good 10 minutes of being overwhelmed, I finally decided on this hat. 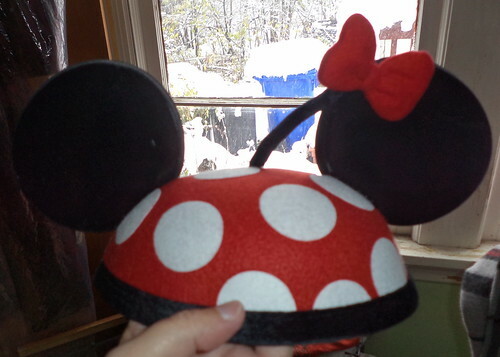 This is Minnie Mouse's hat. It's of a much heavier felt construction than other hats of female characters. I probably could have purchased a straight Mickey Mouse hat; mom does remember the Mickey Mouse club; but I really liked the bright color and the bow of Minnie's hat. Due to the heavy felt, you have one option for writing. It's more expensive to personalize the hat, but mom is worth it. I wrapped it up, put it in a box and sent it to my niece, Christina. She did not know what the package was. She could remove it from the shipping box but she was not to open it. 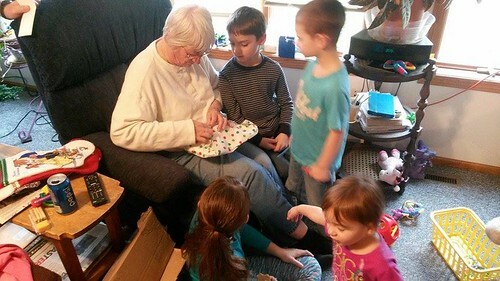 All the older great-grandkids were to gather around my mom and watch while she opened this mystery gift. Christina was to have her phone at the ready to take photos. They were finally able to open gifts this past weekend. Mom had already received a "regular" gift from me so this was quite a surprise. Wyatt sits to mom's left. Kalub stands in front of her. Makayla sits on the floor and Lyllie doesn't care and is wandering away. Well, she's not quite 2 so this is all very exciting but what's this over here? Even though Kalub's face is blurry, I love his look. Wyatt is bemused. Can't tell if Makayla thought it was silly. She never, ever has to wear this again. It was totally and completely worth every penny I spent. Yes, I win Christmas this year.